One of the cars being transported. Ferrari GT racing team Maranello Motorsport will employ a customised Iveco Stralis ATi as its workhorse to transport cars, spare parts and equipment around the country. 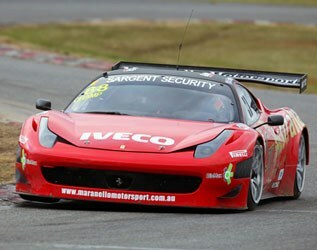 Maranello Motorsport has been competing in Australia's premier production sports car series for more than 15 years, winning many events in spirited Ferrari GT race cars. "Racing is an important part of Maranello's business and our company's commitment to excellence, and its success on the track, has attracted some of the top drivers, including Alan Simonsen, Peter Edwards and John Bowe, to join the team," Maranello Motorsport's Managing Director, Mark Coffey, says. Based in the inner-Melbourne suburb of Richmond, Maranello sells, restores and services a range of classic and modern Ferrari models, as well as other 'supercar' marques. 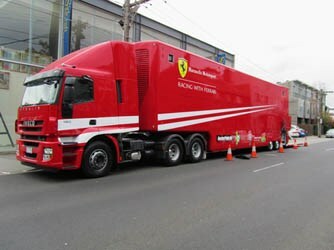 The Maranello team uses an Iveco Stralis ATi prime mover to transport cars, spare parts and workshop equipment to GT racing events around Australia. According to Coffey, Iveco and Ferrari have a long-standing partnership in Europe which has been extended into Australia. "Our Stralis is a fantastic product and we're very happy with it," he says. "It's a European-styled truck and something anyone associated with motor racing would recognise." Mick Zielinski, Sales Manager with Adtrans Laverton, the Iveco dealership that supplied the vehicle, says the Stralis has been painted Ferrari red and fitted with an 'aero kit' and special alloy wheels. "Maranello received a shiny red truck that really looks the part," he says. The team covers more than 1,000 kilometres each month travelling between Maranello's headquarters in Melbourne for six rounds of GT racing competition and 12 track days each year. "We need to get to races and events safely and on time," Coffey says. "The Iveco Stralis gives us the reliability and security to ensure this." The Stralis ATi is one of a number of models that is manufactured by Iveco in Europe and supplied to the Australian market by its subsidiary, Iveco Trucks Australia. The company also has a manufacturing plant in Dandenong, Victoria which produces more than 600 trucks each year, making the plant a major player in the local truck and bus industry. The facility has been operating for more than 60 years, and has been owned by Iveco for 20 years, directly employing 150 people and creating employment across Australia for thousands of people in related industries, from retailing operations to component suppliers. The Maranello team's Stralis ATi has the Active Time sleeper cab configuration. "The cab is ergonomically designed to minimise driver fatigue- a concern when driving long distances," Coffey says. "The bunk in the cab also gives us extra accommodation should we need it." The cabin has a fully-adjustable air suspended driver's seat and a fully-adjustable steering column which is controlled by pressing down on a button on the cab floor. There are multiple storage compartments throughout the ergonomically designed cab. The truck's transmission is the ZF Eurotronic II 12-speed, which is a fully automated two-pedal system, which also aids in reducing driver fatigue. 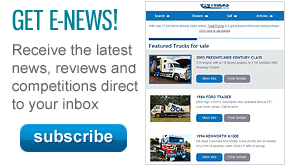 According Zielinski, automated transmissions are becoming the norm for modern trucks. "The automatic software applies economical driving principles to select the ideal ratio and protects the transmission against over-revving while reducing clutch wear, fuel consumption and acoustic emissions," he explains. The Stralis operated by the Ferrari team is powered by an Iveco 10-litre Euro 5-compliant Cursor engine with a variable geometry turbocharger (VGT) which delivers 450hp from 1,600 to 2,000rpm. The Cursor engine uses the selective catalytic reduction (SCR) system to reduce the exhaust emissions and to comply with the current Australian and European emissions standards. Click here to find Iveco trucks for sale. 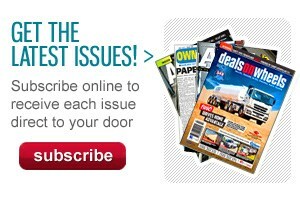 Click here to find new specs for Iveco trucks.